You can now keep the Apex Challenge with you right through the year with items from our exclusive new range of souvenir merchandise. As well as our specially-designed 2012 T-shirt and stylish hoodies we will also have several other items available at our upcoming event at Bramham Park. 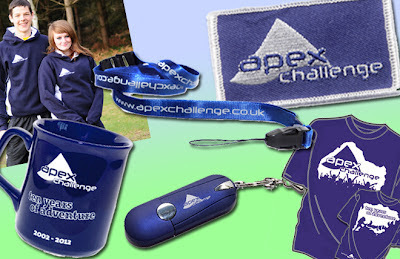 Make sure you bring some money with you to the event if you'd like to buy something from the Apex AdventureStore. Then you'll be able to remember your adventure all year round! Are the mugs plastic or pot? - I could do with a new plastic mug for camp! The mug is a high quality ceramic - and pretty durable so should be able to withstand the pressure of camps! Check out the brand new Apex promo!